The MultiCal pressure module is chosen by NASA for the Space Shuttle and International Space Station. 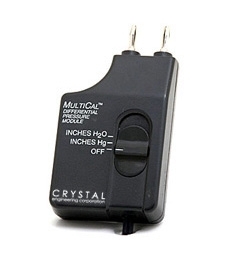 These modules convert your meter into an accurate pressure measuring system. The analog signal is clean, accurate and fast, so you can even use MultiCals with oscilloscopes to measure dynamic pressure. (Polytetrafluoroethylene) penetrated, hard anodized, aluminum (transducer housing), 316 stainless steel, buna-n (O-ring). Battery: One standard 9V battery. Battery life: 400 hours typical (alkaline battery). Our sensor is all welded stainless steel. It does not use o-rings, thread tape, sealant, or epoxy. As a result, the MultiCal can be safely used with any liquid or gas compatible with 316 stainless steel.